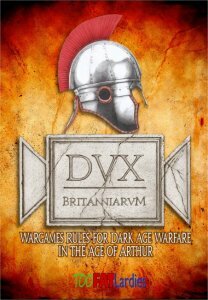 Dux Britanniarum is a set of rules for the Arthurian period published by too Fat Lardies in 2012. The rulebook includes a simple campaign system in addition to the tactical rules. Armies typically consist of less than 50 figures, making this a relatively easy period for which to paint up an army. The campaign system caters for two players, one Romano-British and the other Saxon, to contest dominion over one of the small British kingdoms left behind when the Romans departed. A campaign begins with the Saxon player launching hit and run raids, trying to amass enough loot to be proclaimed a Warlord, after which he may start fighting full scale battles against his Romano-British foe to try to annex a province. Meanwhile his opponent will be building up wealth and influence to progress his own career. In addition to the rules, TFL also sell starter armies for both the Romano-British and Saxon contingents, using the Gripping Beast range of 28mm figures. The figures illustrated here are from the Romano-British starter army, along with a special Arthur personality figure (on the left) which was a limited edition freebie for early purchasers. Shield transfers are by LBMS. Here a noble commands some levy troops. At the start of a campaign both sides field only infantry, though in later stages either or both may be able to afford to add cavalry to the mix. Another shot of the Romano-British army - levy bringing up the rear, elites (foreground) and warriors (background) leading the way. Each side starts with a group of missile troops - slingers in this case. The full Romano-British army arrayed on parade. Do come along to the Lardy Ulster Fry on 31 August to see Dux Britanniarum in action, along with several other TFL games! You can find further details in previous episodes of this blog. Not long to wait now for the Lardy Ulster Fry! The photo shows a game of I Ain't Been Shot Mum in progress at the UWS, set on the Eastern Front in 1941 and using 15mm figures. This set of rules, version 3 of which was published in 2011, is aimed at Company level, meaning that a player typically commands two or three platoons, with the section or squad as the basic unit. As in most Lardies rules, leaders or "Big Men" are important for commanding in battle. If one side has more or better Big Men they will have a decided advantage. The sequence of play is controlled by a deck of cards, which helps represent the role of Friction in battle - again a Lardie trait that adds greatly to the realism without diminishing the fun element of the game. This is one of the games we plan to feature at the Lardy Ulster Fry. Join us next Saturday, 31 August, for a day of wargaming using Too Fat Lardies rules. Saturday 31 August will see the Ulster Wargames Society host a "Lardy Ulster Fry" day in tribute to the popular rule sets produced by Too Fat Lardies. Note that all our "demonstration games" mentioned below will be open for visitors to join in, though places will inevitably be limited. If you'd like to sign up in advance for any of the games, please send us a comment with your name and the preferred game. Due to the expected popularity of the Chain of Command demo, advance bookings for this game will NOT be taken. Any children participating must be accompanied by a responsible adult. The main event of the day will be the visit of Richard Clarke of Too Fat Lardies to demonstrate his new World War Two rules, Chain of Command. These rules, to be published on 21 August, have already generated considerable interest among the wargaming community. They place the player in command of a platoon, with some support from higher levels. The player must manage his resources and demonstrate his leadership skills as he uses appropriate tactics to achieve his mission. Richard will be running several games of Chain of Command on the day and will be happy to explain and demonstrate the rules to participants and onlookers. The game will feature German and US forces somewhere in France, 1944. World War One has for a long time been a poor relation among wargames periods. Trench warfare, machine guns and heavy artillery make it difficult era for which to design an interesting game that isn't totally one-sided. 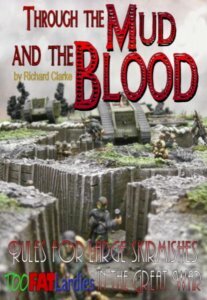 However, with interest sure to be high during the forthcoming centenary period, Through The Mud and the Blood is a set of rules that promises to break the mould and give the feel of the Great War in an historically plausible manner whilst still retaining the enjoyability factor. The rules cover platoon to company sized actions. Our demonstration game will be loosely based on the Gallipoli campaign. The Sharpe novels and TV series by Bernard Cornwall have popularised the role of the Riflemen and light infantry of the Napoleonic Wars, especially in the Peninsular War campaigns where the Duke of Wellington's army, along with its allies, took on the French. Sharp Practice (the name of which of course is totally unrelated to the aforementioned novels!) 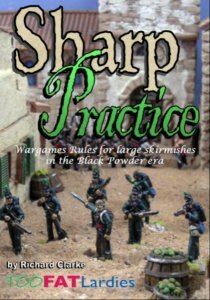 are the ultimate rule set of rules for wargaming the actions of literary heroes, with swashbuckling adventures in the black powder age. Our demonstration game will feature an action in the Peninsular War, and is sure to be incident-packed and fun. The legends of King Arthur have always held a fascination for many of us, even though historians and archaeologists have sought to debunk many of the popular myths. Dux Britanniarum, one of TFL's most recent rulesets, takes a step back from that controversy and presents a background set in the aftermath of the Roman withdrawal from Britain. Barbarian raiders from Germany - Saxons, Angles and Jutes - threaten the patchwork of small kingdoms that have emerged in place of the centrally controlled Roman Province. Players take the part of a British or Saxon Lord, the former trying to fight off the depredations of the latter. Our demonstration game will feature Saxon raiders attempting to get away with their loot before the British forces can intercept them. World War Two has always been a favourite period for many of us. 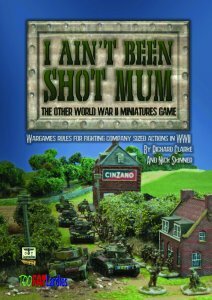 I Ain't Been Shot Mum is a company level game that, like all Lardy games, reproduces the "friction" that has such an effect on the forces fighting in battle. The rules are written with a focus on command and control and the importance of leadership on the World War Two battlefield. Our demonstration game is set in the early days of Hitler's invasion of the USSR, Operation Barbarossa. It should be an interesting contrast between experienced German commanders and novice Soviets. Will the German blitzkrieg break through dogged Russian resistance and spell disaster for Stalin's forces? Some of our friends from Larne will be running another World War Two game, set in France, 1940. Unlike the other games this will not follow the Too Fat Lardies theme, but instead will be played with Rapid Fire rules. Join us on Saturday 31 August for a day of Too Fat Lardies games. 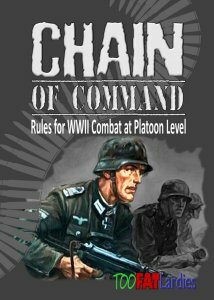 Chain of Command WW2 skirmish rules. Do feel free to come along and either join in or watch! The event will be held at our usual meeting place in the suburbs of East Belfast, the church hall of St John's Church on the Castlereagh Road. Opening hours 10:30 to 5:00 approximately.